Head, who has been involved in F1 for more than 30 years and is one of the most respected engineers in the sport, feels his idea will "very much upset the purists". But he said current proposals to facilitate overtaking and improve the spectacle were unlikely to work and urged the FIA, the sport's governing body, to "be a bit more adventurous". If you line the cars up with the fastest at the front and the slowest at the back, why should there be any overtaking? Previous attempts to increase overtaking have failed. The boldest of those was forbidding refuelling between qualifying and the race. The move was designed to open up the possibility of positional changes in the race because teams would adopt different strategies. But, in practice, the strategies of the leading teams do not tend to vary significantly. Any changing of position that takes place tends to be a result of what happens in the pits not on the track. For 2009, the FIA has introduced another series of changes to spice up the sport. These include introducing a "boost" button to provide a brief burst of extra power and changes to the aerodynamics to make it easier for one car to follow another closely. But Head, speaking ahead of the start of the new season in Australia, says he does not think they will make a big impact. "If you allow the guys to do all this practice and testing and then you line them up with the fastest at the front and the slowest at the back, why should there be any overtaking?" he said. "Maybe overtaking will be less difficult, but if a guy is back there because he is 0.3 seconds slower than the car in front, why should he overtake [it]?" Head admits there would probably be a number of objectors to his idea. 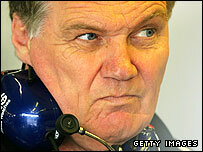 He anticipates some people would want to know how the grid would be formed for the first race of the season. He also feels some drivers would be upset. "The fastest might say: 'Well, overtaking is a risk and it puts us more at risk than the guys who don't have to do that'," said Head. "I'm sure people would complain. "But I do come across a lot of people who say they like watching motorbikes [more] and I have to say I'm a little bit in that camp because there isn't a lot of overtaking in Formula One. "What's really boring is if there's a car that is genuinely faster sitting on the tail of the car in front and his race is destroyed. "We've had some races at Monaco where people have been held up for 30 or 40 laps when they've been a second or two faster than the car in front, and I think that's a pity." Head's view is largely at odds with that of FIA president Max Mosley, who has in the past likened the strategic complexity of Grands Prix to chess matches. Mosley admits overtaking is currently a little bit too difficult, but he argues that if it became too easy it would lose its appeal. Head says his proposal had not come out of the blue and was not motivated by his team's recent fall after dominating F1 in the 1980s and 1990s. "I've suggested [it] to the FIA in the past and I've made those suggestions at times when Williams have been winning races," he said. As evidence his proposal would work, Head highlighted the 2005 Japanese Grand Prix, which has been hailed as arguably the greatest single race in F1 history. The fastest cars qualified well down the field because of a rain shower in qualifying. The result was a dramatic race that included a number of daring overtaking manoeuvres. 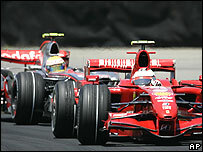 Fernando Alonso passed Michael Schumacher around the outside of a 180mph corner while Kimi Raikkonen eventually claimed victory with a superb overtaking move on the last lap. What will Hamilton do next?